There can no longer be any denying it anymore. We live in two very distinct Americas now. Those who now go out of their way to be offended, or an opportunity for attention getting self pity. 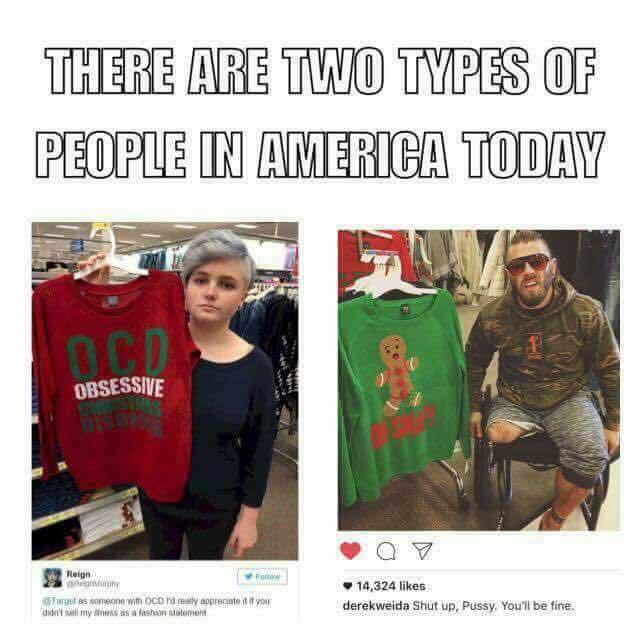 And those who live once was considered a normal life, but are now considered offensive (at the least) by the other America. The above meme shows what I'm talking about. A stereotypical self absorbed millennial seeking attention for her, in all likelihood self diagnosed, "condition." Pointing out how hurtful Target is for selling such an inappropriate, insensitive shirt. And yes the irony of me giving my blog post from just yesterday the title EDC OCD is not lost on me. I still think it's a funny catchy title. Then there is the guy on the right side of the meme. A guy with a dark sense of humor, despite having a real injury, being funny. The kind of person I wouldn't mind seeing more of. One last thing. Note the offended one's name. This backs my "Boy Named Sue" theory. I named my theory after the Johnny Cash song. Basically it is: give a kid a messed up name and the kid will grow up being a messed up adult.